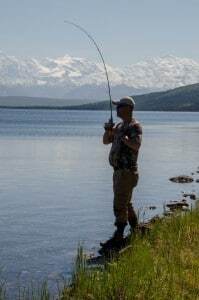 As part of John Hall’s Alaska Tours and thanks to our Poppy’s Wish Heroes’ Vacation, Freedom Alliance was able to give five veterans and their families a very rare and phenomenal experience: a deep-country expedition into our nation’s largest, pristine state. 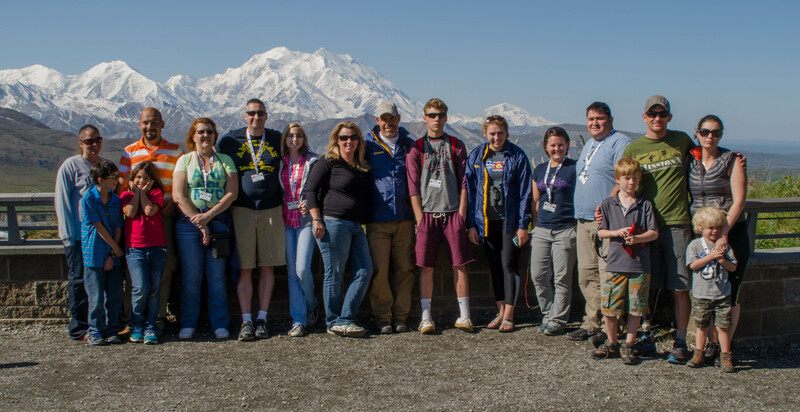 Arriving in Anchorage on a Friday, the families rested up for Sunday’s early-morning departure, which began with a railway ride into the Denali National Park. 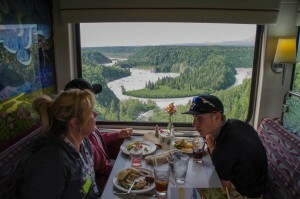 With broad windows designed for sightseeing, the train took us past views of Mount McKinley and the Alaskan Mountain Range that few tourists are privileged to see. On Monday morning, our group was delighted to find a moose cow and her calf ambling through the resort’s courtyard as we boarded John Hall’s very own motor coach for the second day’s adventure. The bus rode through Denali, stopping at Kantishna Lodge, where some of our party panned for gold, while others fished in Wonder Lake. The next day brought another unique opportunity, as the tour took us to a musher’s kennel (mushing is traveling over snow by dogsled). 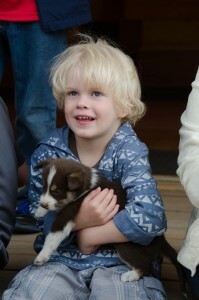 Each one of our 17 guests were handed an adorable puppy to cuddle—only the first perk to the start of a Iditarod-themed visit. The jet boat ride through Devil’s Canyon on Wednesday was sensational, as the Freedom Alliance group boarded this singular vessel built to power through Class III and IV rapids. The 130-mile trip took five hours and brought us so far into remote Alaskan country that we saw land only accessible by jet boat, aircraft, or train/foot. Thursday was spent traveling to our final stop on the tour, but on the way, we visited the Wildlife Conservation Center, where animals in peril are cared for and rehabilitated for re-release. We saw caribou, elk, black bears, brown bears, lynx, moose, and baby foxes. The last day found our crew on a tour boat in Resurrection Sound. 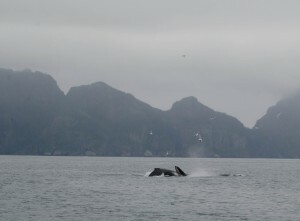 During the voyage, we saw humpback whales, circling and blowing air underwater to make a bubble net in which to trap fish. Pacific white-sided dolphins played in the boat’s wake, and we spotted a pod of orcas, which included a baby. 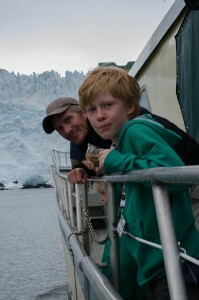 The captain also navigated the boat to one of the tidal glaciers in the region. To our astonishment, massive blocks of ice, the size of houses, split off the glacier (an event called “calving”) and tumbled into the sea, causing a thundering crash. Vince was an Army Calvary Scout, who was medically retired after 13 years in service, which included combat deployments. His time in Iraq resulted in a brain injury, temporary blindness, internal injuries, and damage to his back, knee, and hip. 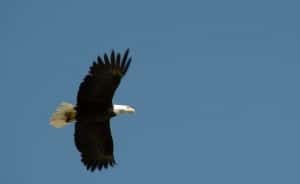 Many of our other guests have experienced similar physical trauma, as well as post-traumatic stress disorder, which causes severe anxiety, insomnia, and other complications. Before his medical discharge from the counter-terrorist Delta Force, Matt was an Airborne Ranger and craved adventure. Having lost a leg in a helicopter crash, he still seeks thrills and challenges, and so this American Heroes’ Getaway was just the ticket for Matt and his family. 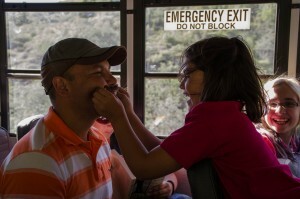 We think it suited all five of our servicemen, and it was lovely to spend time with them, their spouses, and children. It was not only a memorable vacation, but a scarcely-had privilege, and who better to experience it with than these deserving members of our country’s military.